While our 110 acres offers plenty of room for meeting outside we also offer several meeting rooms available for your use. 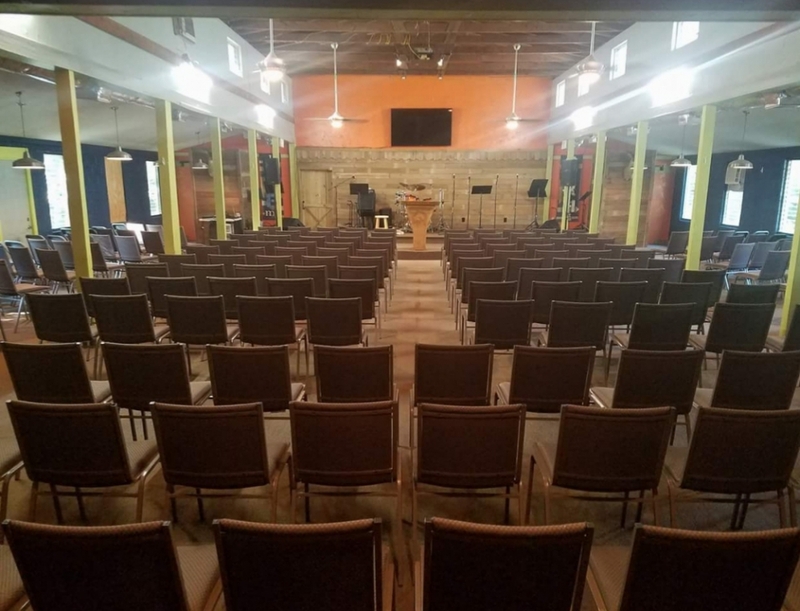 Camp Chapel - Our Camp Chapel is the ideal meeting space for your conference or service. This space has been recently renovated to allow for a more comfortable camp setting and experience. It has received new carpet, paint, central heating & a/c, and lighting. This building accommodates up to 175-200 people. This building also has a built in stage, 75 inch television with hdmi cook up, and a brand new PA system ready for your use. Reserved for Camps with 100 campers or more at no extra cost. Small Camp Chapel/ Cabin 12 - Cabin 12 is a large double-sided cabin. While one side is a bunkroom the other is a large meeting room just across the hall. This meeting room can seat up to 125 and can be transformed into whatever your group needs. A platform is provided as a staging area and chairs are available. Audio/video equipment can easily be set up for use as well. Reserved for groups with 100 campers or less for no extra cost. Covered Pavilion - Our covered pavilion not only serves as a recreational facilities with 4 basketball hoops, but also as a great meeting area for large group activities. The space is able to hold 400 people. A covered stage was recently constructed and has been utilized for worship services or large group times. Enjoy the weather with this option for a meeting area. This building has been newly renovated with brand new interior including central heating & a/c, and carpeting.